Identify Horned Screamer - Wildfowl Photography. 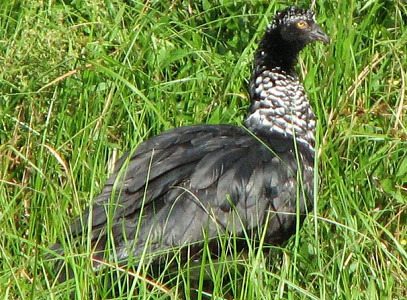 Appearance: - The Horned Screamer has a black head with a whitish crown and long curved feather sticking out from the top of the head, a short dark-grey hooked beak, yellow eyes, the upperneck, breast, upperparts, flanks and tail are black with a glossy green sheen, the lowerneck is speckled with white, the abdomen and underwing coverts are white, there are two sharp spurs on the black wings, and the legs and partially webbed feet are grey. Both sexes are alike with the male usually being slightly larger. Size: - Typical Adult is 84-95cm (33-38in). Food: - Mainly vegetation - plants, leaves, stems, seeds, also occasionally insects. 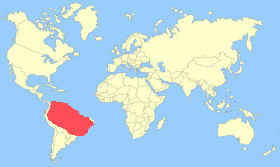 Habitat/Range: - Well-vegetated marshes, swamps, moist tropical forest, and savannahs in tropical South America - Colombia, Venezuela, Brazil, Bolivia, Peru, Ecuador, Suriname, French Guiana, and Guyana. Breeding Season: - Late November to early May in Columbia. Eggs: - 2-7 olive-brown eggs. Notes: - The Horned Screamer is a good swimmer but prefers to be on land. They do not migrate but stay in the breeding grounds of South America. Horned Screamers, as their name suggests, have a very loud call which can be heard for miles. Compare with other Screamer species.